Athanasius (1): Did Jesus get sick? “The death of men under ordinary circumstances is the result of their natural weakness. They are essentially impermanent, so after a time they fall ill and when worn out they die. But the Lord is not like that. He is not weak, He is the Power of God and Word of God and Very Life Itself…. How could He fall sick, Who had healed others?” (p. 51). If I am correctly understanding him, I think Athanasius is on shaky ground here. The incarnation means that God the Son became like us in all aspects of our experience as humans in a fallen world except sin (Hebrews 2:17). While Jesus himself was unfallen and sinless in the world, I don’t see any reason to think he was immune to the effects of living in a fallen world (such as sickness). He was not invincible. At times he was very, very weak (cf. Luke 22:44). I imagine that if he had been crucified at age 60, rather than 30, he would have gotten a few gray hairs. I imagine that, from time to time, he got the flu. I imagine he got headaches, stomach aches, sore muscles after exercising, aches and pains, coughs and runny noses. As a teenager, I imagine he got growing pains. I imagine – living as he did before dentists and toothpaste – that he perhaps got cavities or had teeth fall out. Perhaps his eyesight was not 20/20 his whole life (not many peoples’ is). And so forth. This is the glory of the incarnation – he became fully like us. The incarnation means that God the Son became like us in all aspects of our experience as humans in a fallen world except sin (Hebrews 2:17). Well, no, not really. Jesus didn’t experience every disease or physical or mental abnormality that inflicts mankind. That much is obvious. Therefore the ‘made like his brethren in all things’ of Hebrews 2:17 cannot necessarily be used to support the notion that Jesus got sick. I’m not really sure what I think about Athanasius’ argument. I mean, on the one hand, the ‘How could He fall sick, who had healed others?’ line makes sense. A parallel would be ‘How could He fall into sin, who had forgiven others?’. For Athanasius, the healing of illnesses and the forgiveness of sins are interrelated; they are both aspects, and not separated aspects, of Christ’s salvific work: to restore mankind to incorruptibility. It seems like a rather speculative issue, to be sure. I remember thinking similar things when I first came across it. On what is perhaps a more important issue, I’d be curious to know what you think of the fact that Athanasius does not mention substitutionary atonement as the reason for the incarnation of the Word of God. On your view, what does this mean for Athanasius’ understanding of the gospel? I have already planned out my second and third posts on Athanasius, and the third deals with the relation of incarnation and atonement. So when that’s up, we can talk more. For now I could simply say that its not accurate that Athanasius does not mention substitutionary atonement as a purpose of the atonement. He writes, for example, in IV.25, in addressing the necessity of the crucifixion, “he had come to bear the curse that lay on us; and how could he ‘become a curse’ [Gal. 3:13] otherwise than by accepting the accursed death? … The death of the Lord is the ransom of all.” Though certainly Athanasius emphasizes other purpose for the incarnation as well (and I would agree with him, as I’ll discuss in post 3). Two other quick points on what you wrote: (1) that Jesus did not experience EVERY sickness does not invalidate the point from Heb. 2:17 that he experienced the full range of human experience. Nobody experiences EVERY illness. To do so would itself be untrue to human experience. The point is he lived a normal human life and was subject to the conditions of a fallen world. He was not, as Athanasius imples, invincible. (2) The “how could he get sick, who healed others?” argument strikes me as very weak – lots of people performed healings in the Bible, and it never proved they were exempt from sickness and corruption themselves. 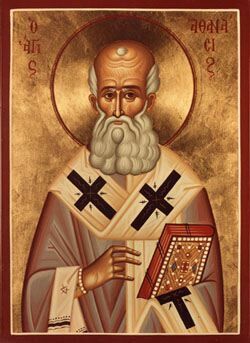 I know I am a little late to the party but, first of all you are on shaky ground if you oppose Athanasius in this =) The Church later canonized his writings, Athanasius stands with the majority of Church history as being right on in this matter. The idea that being human means that you must be vulnerable to sickness is a false assumption. For Athanasius Christ was “truly” human in that he shared communion with the Father. Our “sickness” for Athanasius is that we sin. Sin as Athanasius puts it is walking into “non-existence”. Sin is the lack of communion with God. So the redemption of sinner must come through communion with the creator. Christ is the only one who knows the Father. Knowing the Father is eternal life John 17:3. So Christ becomes incarnate so that we may know the Father through him. So that by knowing the Father we may also have life. In the truest sense of the word as long as Christ remains in the communion of the Father and Spirit he cannot experience sickness naturally, thus he would never die naturally. Adam and Eve would have never experience sickness or death naturally had they remained in communion with God. 1 Corinthians 11? Is it a coincidence that when he speaks of communion and those that are defiling it are sick and dying? This is essentially what Athanasius is getting at. Lack of communion equals sickness and death. Christ was always in communion with the Father and Spirit and has never ceased to be in communion with them. Therefore death had to happen unnaturally for Christ. Being truly human means to be in communion with God. Not to be fallen broken and corrupted. God did not create man in a corrupted state therefore the definition of human you are working with must change. if I understand you, you seem to be arguing that Christ’s incarnate body was like Adam’s before the fall. I’d be curious to hear if you have any reasons why you think this is the case. Would you say that Adam could sweat blood when anxious, as Christ did? Also, the fact that Athanasius’ writings were canonized does not mean that every particular point of his theology was affirmed by the church. On the canonization issue, I agree with you but the point I was trying to make was he holds a great deal of authority. If you feel yourself disagreeing perhaps you have misunderstood or misread Athanasius. Which I believe is the case for a lot of his modern day critics. The way that the Eastern Church views humanity is that we are all born free of the guilt of ancestral sin. That is we (personally) are not born corrupted by the sins of our ancestors. This would be in opposition to the Augustine doctrine of Original Sin. Yet what Adam’s sin did do was cause the whole cosmos to fall into corruption. So humans are born into an imperfect world, i.e. we have not individually sinned, but everything that is physical is corrupted by the consequences of sin. Subsequently all humans since Adam have been disadvantaged (but still have free will) yet chose their own corruption at some point. When we choose to sin we have chosen sickness and death to carry on in our bodies. It may seem like a minor distinction but this is how Athanasius thought of it. Think of Paul’s language when he talks of Spirit and Flesh. So all humans including Christ are born corruptible but not corrupted. The difference being for Christ is that he was fully human (Born from Mary) but never was corrupted by sin in that he never abandoned his communion with the Father and Spirit, therefore never sinning. Christ is the New Adam, and the Virgin Mary is the new Mother of all the Living (Eve). This is the doctrine of recapitulation. So yes I would say that Christs human body was like that of Adam’s before the fall. Does that mean that Adam could have sweat blood droplets pre-fall? I don’t know. I would think so. I don’t know that anyone has a perfect explanation for that but Hebrews 4:14-16 I think explains it rather well. Christ sympathized with us completely (even in our pain) except not knowing sin. When looking at the passage in Greek Luke does not necessarily say that Christ was anxious, rather it says that he was in great struggle over the temptation to choose not undergo or opt out of what was about to take place. This is why he commands the disciples to pray so that they do not fall to temptation. It is also unclear in the Luke passage as to whether they were actual droplets of blood or if Luke is giving a picture as to the great amount Christ was sweating. I look forward to the other posts. A quick point, however: there is substitutionary atonement and then there is substitutionary atonement; or, there is substitutionary atonement in the broad sense, meaning Christ’s vicarious suffering in His bearing of our sins and their effects, and then there is substitutionary atonement in the narrow sense, meaning Christ’s vicarious suffering in His satisfaction of divine retributive justice. I do not think Athanasius teaches the latter. But if you think otherwise, I’d like to hear what you have to say. As for Jesus and sickness, you make good points. I’ll have to think about it more, and perhaps get back to you if I have something of worth to contribute. That sounds good Drew! Regarding whether Athanasius affirms PENAL substitutionary atonement, as you distinguished it, pp. 169-173 of Pierced for Our Transgressions, by Jeffrey, Ovey, Sach (IVP 07) makes the case that he does. Just taking my first substantive dip into Athanasius myself, I don’t know that I could say anything more on that myself. My only thought is that I think we should always be cautious in thinking that if someone doesn’t affirm something, they therefore don’t believe in it. There are lots of things you can I agree on that we wouldn’t think to affirm, because they are not in dispute (e.g., that there are 150 Psalms, or that Philemon is canonical). But that doesn’t mean future generations would be justified in thinking we didn’t believe in them. Going back over this passage from Athanasius, the force of the argument seems to be that any suffering Christ undergoes is done so voluntarily, not by necessity. So in that sense, Christ could not ‘fall sick’, if by falling sick it means that sickness somehow has power over Him. I don’t think this necessarily means He didn’t get sick, nor do I think that is what Athanasius is arguing. If He got sick, He did so choosing to undergo sickness, just as He voluntarily went to His own death. But being the ‘Power of God and Word of God and Very Life Itself’, He of course had control over all of this. I am familiar with the arguments made in Pierced for Our Transgressions, and I don’t think they’re very good. But that can wait for the later posts. yeah, we just differ on how to read Athanasius here. I think the larger context makes it clear that he is saying that Christ factually did not get sick and his body was incorruptible. But lets talk more after post 3. Athanasius doesn’t seem to think Christ was incapable of illness; as Drew pointed out, it seems more like he’s saying Christ couldn’t be subjected to death by illness out of natural necessity apart from his consent. He took on our weakness willingly, and died a willing death, not a death that was inevitable in the first place from natural necessity. The concern seems to be with the inability to overcome corruption that is displayed by someone dying from illness. Notice the emphasis on the fact that Christ takes on our infirmities. Here Athanasius seems to understand infirmities in a broader sense than just particular physical illnesses. They are our affections/passions, our tendencies towards corruption—the disordering of soul and body and their alienation from God’s life. Not everyone has the same specific illnesses; but everyone inherits the tendency towards corruption. Athanasius thinks that Christ does take on our corrupt human nature, not an unfallen nature that has not experienced the physically and spiritually corrupting effects of Adam’s sin. And this means not just a flesh that has a tendency towards death and decomposition, but a soul that is inherits the disordered tendencies (“sins”) introduced by the fall. He is truly like us in all things except acts of sin (the personal choice to misuse human nature) and Athanasius does not fail to witness to that. Interesting passage from the Against the Arians. I don’t see anything about Christ’s consent in the above passages, or the one I quoted. He just says that Christ could not get sick. Its more ambiguous, on the other hand, to determine what Athanasius means in referring to Christ “bearing our infirmities.” So we differ on how to read Athanasius here. Bless you. The fact that Athanasius lists reasons why Christ did not allow himself to fall sick implies that it was something He could have chosen to do. It wasn’t because his incorruptibility made it impossible that this didn’t happen. Rather it was God’s way of communicating the fact that Christ could not destroyed or overpowered by disease. It was not fit that the Lord should fall sick, but it also was not impossible. Athanasius explains that by “bearing our infirmities” he’s talking about being saved from death and our affections/passions. And he makes it clear that it was only by *carrying* this condition that the problem could be dealt with, not by remedying it extrinsically by an act of will as God had done in the past. So it sure sounds like Athanasius is saying Christ takes on our corrupt human nature. I am not arguing that, for Athanasius, his incorruptibility made him unable to get sick. I am arguing that, for Athanasius, he in fact was incorruptible, because He disallowed sickness in his body. The fact that it was Christ’s choice does not take away the difficulty. For Athanasius, Christ had a different kind of body than others. Others were corruptible. His was not. The fact that this was by his choice doesn’t take away the problem. The quote you give does not talk about Christ’s flesh. It says the Word could not be destroyed by death; but obviously everyone agrees that according to his divinity the Word cannot corrupt or die. Your quote does not prove that Christ’s body lacked corruptibility or corruption. If we go a little further in the section then it does say that Christ’s body was made strong because He dwelt in it. But this isn’t the same as saying that his body didn’t have a tendency towards corruption. Its just to say that God’s uncreated life inhered within the corruptible (and corrupted) substance of the human body his divine person inhabited. So Christ could choose how to manifest the underlying corruption of his human nature (like choosing to let his tendency towards sickness result in sickness, choosing to let his tendency towards death result in death) and how react to his corruptibility, because He had mastery over it. But the tendency which we all share in common was there. Christ appropriates the affections of our nature, and carries our infirmities. The difference between Christ and us is not that his body was different in kind, but that He is a divine person, not a human person. As such He is able to unfailingly actualize the divine energy of incorruptibility that has been present in humanity in potentiality from the beginning via the image of God. He can do with our common humanity what we could not–deify it by uniting it permanently to God’s power. I think that quote is talking about the Word as incarnate, not the Word according to his Divinity. And it says he was not like other men, whose bodies would naturally expire after a time because they are “essentially impermanent.” According to Athanasius, Christ is not like this – he does not share our “natural weakness.” However you slice it, this is an unorthodox doctrine of the incarnation, in my opinion. Even on your reading of Athanasius, where Christ “could choose how to manifest the underlying corruption of his human nature,” you still have the same problem, in effect, since that super-ability is something that separates him from common humanity. It seems our main difference here are on how to read Athanasius more so than than the incarnation itself! I am happy to just respectfully disagree here, rather than pulverize our differences into fine sands of nuance. But feel free to respond if you desire! The latter is a consequence of the former. Athanasius is not saying that the physical flesh of Christ is an uncreated divine person, but that the indwelling of an uncreated divine person strengthens the flesh through the proper use of the flesh. Nor is he saying that Christ assumes some kind of “super flesh” that is itself powerful apart from the Word’s correct use of the flesh. Notice that Athanasius does think that it is “natural” in one sense to the human body to be immortal and persist incorruptibly. It is natural insofar as the image of God is the formal cause of human nature (the intrinsic principle that constitutes it and gives it the structure by which it develops). In another sense it is natural for man to die, because human nature is created out of nothing, not being formed form any pre-existing thing that it can return to when it corrupts. Through the misuse of free choice, human nature gets disposed towards disunion with the image of God–it enters a state of corruption, or twistedness. It is this human nature (misusable and corruptible pre-fall, misused and corrupt post-fall) that Christ assumes in the incarnation. By his proper use of free choice throughout his life, He strengthens his humanity (body and soul). As the Second Adam, Christ does indeed “preserve that Likeness through constant contemplation, [so] his nature is deprived of its power and he remains incorrupt”. So again the difference is that Christ is a divine person who never fails to use his free choice rightly, not that He has a different kind of body. How is his body’s natural tendency towards death and corruption held back? By his proper use of free choice, not because it is a different kind of body. After all, the body He takes on is created, and thus has the same “natural” tendency towards non-being that Athanasius ascribes to all creatures. Thus, the “super-ability” that Christ has to resist the corrupt tendencies of his flesh is not a difference in body-type (kind of nature) but a difference in the fact that He is the Word (a divine person, not a human person). And this fits with the other quotes I’ve provided about Christ healing his humanity from infirmities from within through his unfailing proper use of free choice. With your interpretation its difficult to explain why Christ’s body can die (after all if it can’t get sick because it is strictly incorruptible and uncorrupted like you say, it shouldn’t be able to die either), as well as why Athanasius speaks elsewhere of Christ bearing our infirmities (which he understands as corrupt affections/passions). How would you explain these things? Although you and I are in agreement on much of the Incarnation (though I doubt that you would say his humanity was corrupt), I think its important to realize that Athanasius’ doctrine is the Orthodox one. I’ve been thinking. Jesus was in such turmoil that he was sweating blood. If you or I were sweating blood profusely, they would take us to straight to the emergency room and say, “Doc, this man is sick!” In High School, I would get nervous before the games and would throw up. They call it getting the “butterflies” in your stomach. I never got to the point of sweating blood. Now if Jesus got to the point of sweating blood, I guarantee you that He had already “thrown up” everything a long time ago. If you’re sweating blood, you are feeling extremely nauseated and sick! Jesus can relate to cancer patients taking chemo. How did Jesus get through this horrific event? Luke 22 tells us that He had a “doctor” on site. There was an angel sent ahead to “strengthen” Him. The Healer actually needed outside physical aid because He was also a man. If interested in more scriptures on Jesus being sick and such, check out my entry on the subject. Well.. Matthew 8:3 “Jesus reached out his hand and touched the man. “I am willing,” he said. “Be clean!” Immediately he was cleansed of his leprosy.” Anyone in their right mind who COULD have gotten sick would NOT have touched someone with leprosy and additionally under Old Testament Law he would have been considered “unclean” (Lev 13). Jesus did NOT get sick likely because He was not only fully man, but also fully God. Death came into the world through sin and although Jesus did NOT sin he was subject to physical death only because John 10:18 “No one takes my life from me, but I lay it down of my own accord” and so he would have NEVER died even as a man if he had not willed it in order to destroy death (ultimately).